Standard Roamers gradually introduce programming ideas and features. 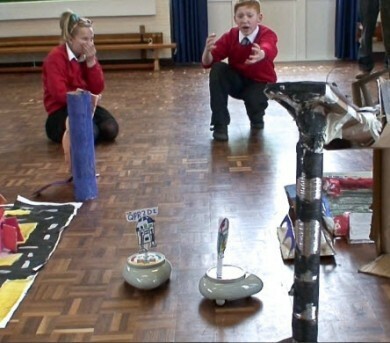 This starts with a simple robot and steadily builds student’s expertise and confidence, enabling them to tackle more challenging problems as their ability grows. Changing the Keypad Module transforms the Roamer. In the simplest version, you program Roamer using a counting paradigm: to make it go forward 2 you press the forward button twice. Similarly to make it pause for 2 seconds, or turn right through 3 quarter turns. In this behaviour, you press a key for direction and a number to tell the robot how far to move. Introduces the idea of REPEAT which helps students develop their mathematical pattern recognition skills. Variable speed, music and volume of sound. Introduces the fundamental idea of procedures. More powerful control of speed and sound volume; ability to change musical scale and tempo, and units of move and turn. Drive Mode and programming of inputs and outputs. The full power of Roamer Logo is unleashed. 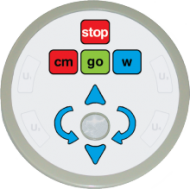 Control includes the ability to drive servo motors. Roamer can respond to more sophisticated programs created on the computer. The modular nature of Roamer means you can purchase just what you need to maximise the educational effectiveness of the system to meet you precise needs. 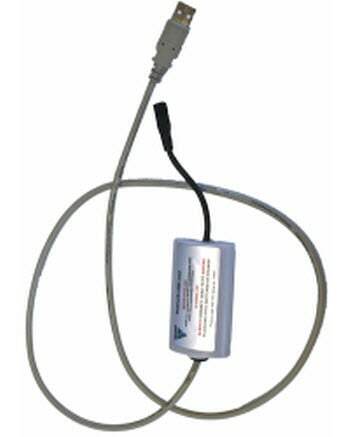 This consists of a Base Platform and single Keypad Module (different options Standard, Activity and Other Roamers). The modular nature of Roamer allows you to extend its capability to suit your specific needs and manage your investment over several budget periods. You can interchange keypads when Roamers move from one classroom to another. 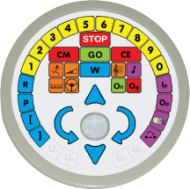 Or, you can purchase extra keypads and configure them to suit your specific needs. 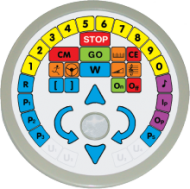 A practical solution is to keep keypads you use regularly ready for interchange and configure those you use infrequently. Several practical accessory packs support Roamers use. Special High Capacity Batteries, Intelligent Fast Chargers Pen Packs, etc. Transforming Roamer into different characters is an important part of working with Roamer. 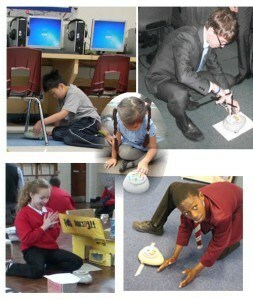 We offer a range of materials that will allow students to do this quickly. These materials provide a foundation for using Roamer throughout the year in your classroom. Many more activities can be accessed for free in the Activity Library. Software packs support Roamer or extend its activity capability. These include RoamerWorld, RoamerWorld Graphics and Logo. Roamers can have special behaviours for specific activities. Many of these are obtainable as Free resources with the Free activities in the Activity Library. Others are available with the Curriculum Packs. 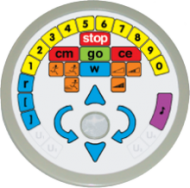 Print and cut out the Keypad Graphic or check out the inexpensive Keypad Graphic Packs available from the shop. The future: Invent and share your activities and keypad designs. To be kept in touch with this development set up your RSS feed. Roamer is a continuing research and development project. A number of other Roamers will become available in the future. Use the RSS Feed to keep in touch with latest types of Roamer as we make them available. This is a series of Roamers with special capabilities to support Special Educational Needs. Turtle Roamer When you drive Roamer by programming at a computer it becomes a Turtle. Watch for interfaces to Logo, Scratch and other packates. 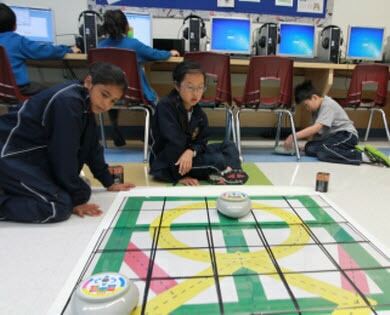 Programming Help: when learners make a mistake programming their robot, it will tell them how to correctly program it. Prompts: Roamer will tell you when it’s switched on; when you’ve left it on and not using it; when you need to recharge the batteries and other useful tips. Roamer plays sound effects to help you know you’ve pressed the right keys. Some tasks include the use of speech and sound effects like a barking dog. Roamer uses a standard American female voice. You can change the voice to male or male and female children. You can use recorded speech. We can work with you to produce Roamer’s speaking different languages. The standard speed of Roamer is 25 cm/sec. Roamer’s top speed is half a metre per second. You can change this default with RoamerWorld software. 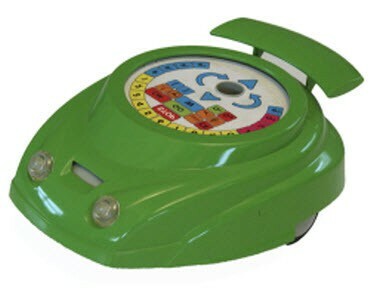 The Infant K-1 has 3 speeds, slow, default (medium) and fast. The Primary and Junior Roamers have 10 speed settings: 5. 10, 15, 20, 25, 30, 35, 40, 45 and 50 cm/sec. You can use Roamer’s User Keys to provide Roamer with a special speed functions. The standard speed of Roamer is 90 degrees/sec. The Infant K-1 has 3 speeds, slow, default (medium) and fast. The Primary and Junior Roamers have 10 speed settings: 18. 36, 54, 72, 90, 108, 136, 144, 162 and 180 degrees/sec. (steps of 10% of top speed). This provides you with the best alround performance, particularly economising on the battery power. This maximises the speed of Roamer by providing it with the fastest possible acceleration. This maximises Roamer’s pulling, pushing and load carrying capability. Even in Standard Mode Roamer is the most precise Turtle type robot on the market. The Accuracy mode gives you the extra precision required for some activities. You can start using Roamers powerful control features using auto animates – which brings Roamer to life and lets very young students observe the possibilities and stimulating their curiosity.. The next step is for youngsters to operate a switch – car lights on, car lights off, pen up, pen down. In small steps students can explore how to program lights, motors, buzzers and incorporate a whole variety of sensors they can engage in sophisticated STEM learning trajectories. Watch out for Roamer’s Control Pod which will provide Roamer with more inputs and outputs. Also watch out for interfaces to Raspberry Pie, Arduino, Gadgeteer etc. Personalise your Roamer with new voices, behaviours, etc. Roamer has 1MByte of internal memory, more than enough for most programs. Wireless ROCOM will allow Roamers to communicate with other Roamers, the computer, your tablet, mobile and the whole internet. To meet the needs of the new Computing Curriculum in England, we have added a progammable variable feature. The good news – this is a Free upgrade. Changes in educational policy, curriculum and advances in technology are normal occurances. Roamer has been designed to adapt to change. So you are protected against obsolescence and in partnership with Valiant keep your educational robots up to date.